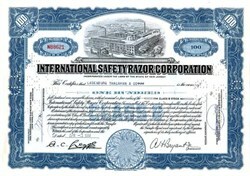 Beautifully engraved certificate from the International Safety Razor Corporation issued no later than 1952. This historic document was printed by the Central Banknote Company and has an ornate border around it with a vignette of a manufacturing plant. This item has the printed signatures of the Company’s President (A. H. Bryant) and Secretary (John Wharton) and is over 54 years old. 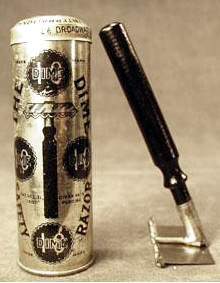 The company's previous names were Molkenrhin Manufacturing and Bryvory Corporation and changed to the International Safety Razor Corporation in 1919. They manufactured safety razor blades to fit various safety razor holders using the trade names "Liberty", "Dime", "Fax", "Sha-ve-zee", "Bond", "Speedway" and "Bob".